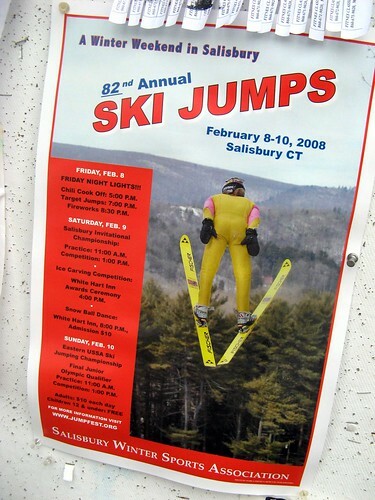 ski jumps, originally uploaded by jahansell. If I possibly can, I'll head over to Sartre Hill in Salisbury tomorrow afternoon to shoot pictures of the jumpers. It's one of the most exciting events in our area - you freeze your fingers and toes, sip hot chocolate and eat chili, and watch in amazement as fearless young men and women FLY down an enormous hill at what looks like 100 MPH, soar out into space, and then land gracefully, swirling to a stop in front of the appreciative crowd. We are finally getting a littles now today, too late to help the jump, but they've been manufacturing it all week to make sure the jumps can go off. More information about the ski jumps here. That looks like fun....to watch, not to do. Zowie! I can just imagine the thrill of that launch! And then, I canNOT imagine the pure panic as I leave the ground and think how much it will hurt when I land!